NEW YORK, NY--(Marketwired - Nov 5, 2013) - The holiday season in New York is indisputably its best. Between the snow flurries, the window displays and the legendary traditions, visitors can't help but fall in love with the city during these magical months. And at the New York Marriott East Side, travelers can receive an early holiday gift thanks to its new Suite Savings in NYC package. 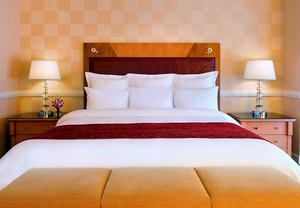 Offering guests a 50-percent discount on upgrading room or suite, Suite Savings is one of the most tempting hotel deals in Manhattan. After all, in a city where space is at a premium, there's nothing quite like, after a long day of sightseeing, being able to stretch one's legs in a junior suite or premium room for a fraction of its normal cost. Because these rooms and suites reside within one of the most beautiful luxury hotels in Manhattan, guests can anticipate a range of appealing amenities, from Plug-in Panels in the guestrooms, to an upgraded concierge lounge with a terrace, a state-of-the-art fitness center and a recently renovated lobby. But one of the best parts about this hotel is its location. From its enviable position on Lexington Avenue, its 629 guestrooms and 17 suites afford guests easy access to a range of attractions. The Empire State Building, Grand Central Terminal, Times Square, the United Nations headquarters and NYC's countless shops, galleries and restaurants are just beyond the hotel's front door. The most exciting destination, however, just may be the Rockefeller Center® where the tree-lighting event, which draws thousands of spectators every year, is scheduled for December 4, 2013. And if guests miss the initial illumination, they have until January 7, 2014 to witness the splendor that has come, in many ways, to define both the season and the city. Valid through December 31, 2013, room rates for the Suite Savings in NYC package start at $299 per room, per night and are exclusive of tax. Seven-day advance booking and purchase is required; reservations are non-refundable. The promotion is available seven days a week, and a weekend stay is required. Travelers may call 1-800-228-9290 and should use the promotional code NYC to book the package. Offering its guests the quintessential luxury hotel experience in Manhattan, the New York Marriott East Side is an ideal destination for any trip to the Big Apple. Guests will enjoy a central location from which they can easily visit Central Park, Broadway theaters and the city's best shopping and dining. When they've seen the sights, they can retire to comfortable guest rooms where HD televisions, spacious workspaces, new bathrooms and fresh, luxury bedding await. The hotel's 525LEX Restaurant & Lounge whips up classic American fare using the finest ingredients, and then pairs it with craft beers, signature cocktails and an exciting wine list. The hotel also boasts 21,000 sq. ft. of event space that, in conjunction with the hotel's close proximity to every transportation hub between Penn Station and the JFK airport, makes it a dream come true for business travelers. At the New York Marriott East Side, travelers can receive an early holiday gift thanks to its new Suite Savings in NYC package. The package offers guests a 50-percent discount on upgrading room or suite now through December 31, 2013. Room rates start at $299 per room, per night and are exclusive of tax.